John Dickson has recently written a book, published as an eBook by American company Zondervan, entitled Hearing Her Voice: A Case for Women Giving Sermons. Last week on this site, I wrote a response to John’s book entitled “What’s happening to our preaching?” John wanted to provide a substantial reply to my response. He has requested me to post his reply as a separate article on this site, in order to avoid the limitations of the comments function on my original post. This makes sense, and I’m pleased to oblige. Update (2015): My review, and this reply, were based on the original edition of John’s book. Since then, John has written a revised edition of his book and it seems that the original edition has been withdrawn from the market. See here for a detailed history of the discussion, with links. In order to assist readers, I have linked to screenshots of John’s book in the text below (click on the highlighted text to get the screenshots). 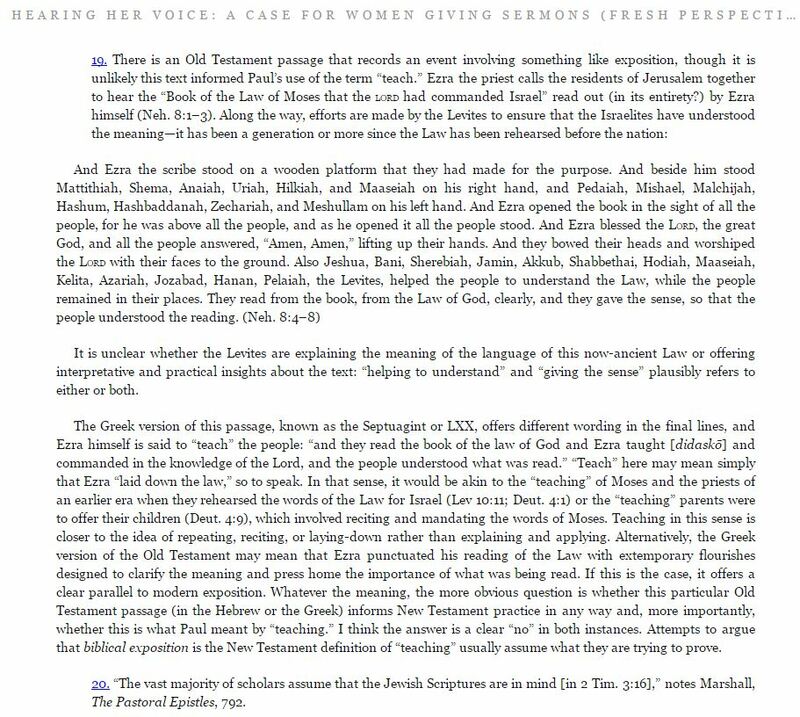 I am very pleased Lionel agreed to post this response to his critique of my Hearing Her Voice: A Case for Women Giving Sermons. The tone and thoughtful engagement of his piece are very encouraging. It is a model of generous disagreement, and I hope I can emulate it. I am especially glad Lionel decided to deal with the argument itself, rather than with my imagined motives or alleged captivity to the age, as other reviewers have done. Evangelicals are not at their best when they attempt socio-rhetorical criticisms of each other; their forte is focusing on what the Bible does or doesn’t say. Lionel has recognized this and engages accordingly. The critique begins with all sorts of compliments about me and my book(s), which I’ll pass over without complaint! I want to move as quickly as I can to the issue of disagreement, but I feel I should first outline the shape of my argument. Lionel has done a good job of describing the technicalities of the case but it is always best to get the author’s emphases and nuances. The logical progression of thought in my book is straightforward. First, I point out that there are lots of different words used for speaking God’s truth—exhorting, teaching, evangelising, prophesying, and so on—and Paul explicitly says these are ‘different’. 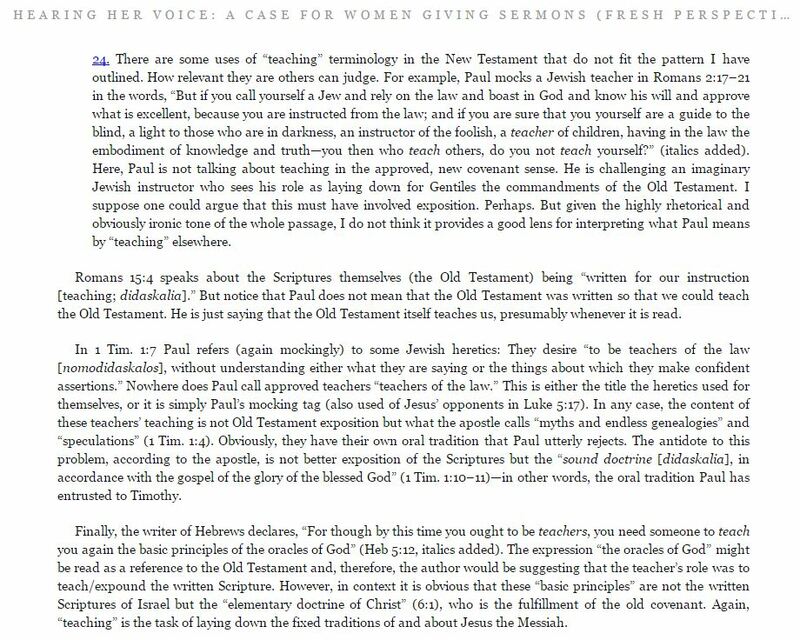 Secondly, I observe that Paul forbids a woman to do only one of these different speaking activities, the one called ‘teaching’ or didaskein. 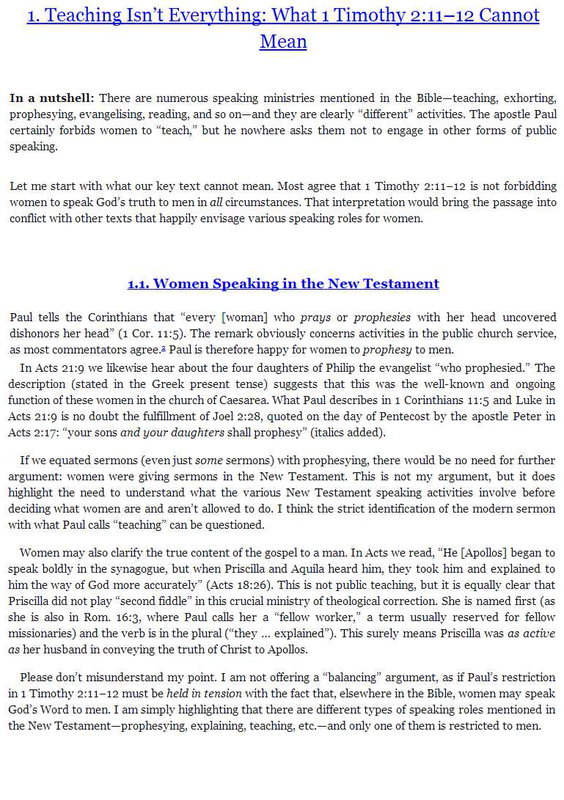 In itself, this grants freedom to women to do one of the other kinds of speaking, but the fact that we have evidence Paul expected women to ‘prophesy’ to the gathered church underscores the point: whereas teaching men is forbidden to women, other forms of encouraging speech are not. The next part of my argument tries to answer the obvious double question: what is teaching and what are these other connected activities? In answer to the latter, I say that ‘prophesying’ and ‘exhorting’ are forms of speech that encourage, comfort or rebuke people in accordance with God’s truth (and, on occasion, ‘exhorting’ refers to a speech following an authoritative reading). 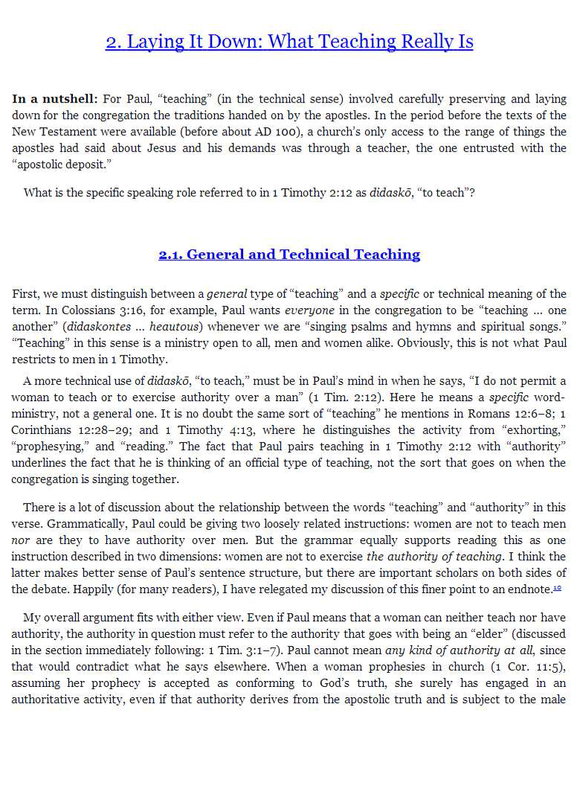 In answer to the first part of the question, I say that ‘teaching’ in the Pastoral Epistles (and occasionally elsewhere) is a technical word for laying down the apostolic deposit, which in Paul’s day was an almost entirely oral tradition. Before there was a written Gospel, your only way of knowing what Jesus said about, say, revenge was through ‘teaching’. The teacher was, as James Dunn puts it, a “walking reference library” of apostolic remembrances and rulings. No one today has an identical role, even if several analogies remain. 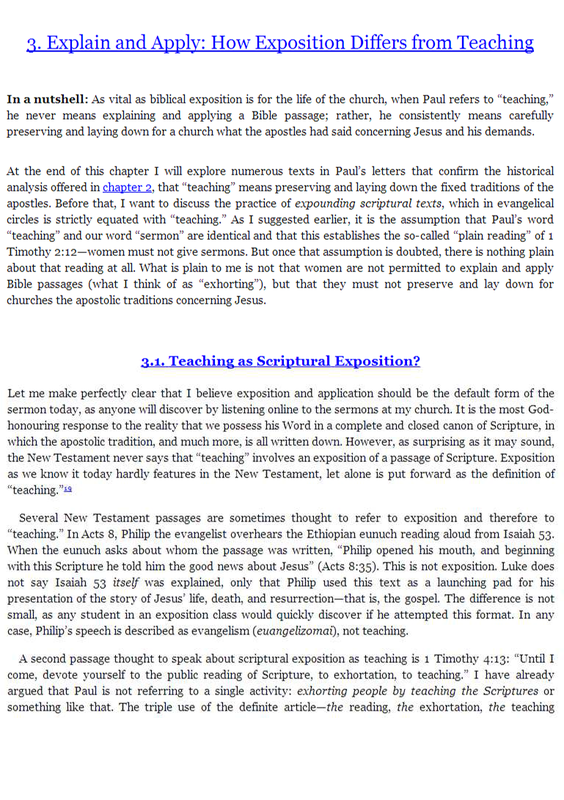 I conclude the argument by saying that the contemporary expository sermon has no New Testament equivalent but would, if we have to categorize it, fit more neatly into Paul’s categories of ‘prophesying’ and (especially) ‘exhorting’ rather than what he called ‘teaching’. If this is so, women may preach expository sermons. 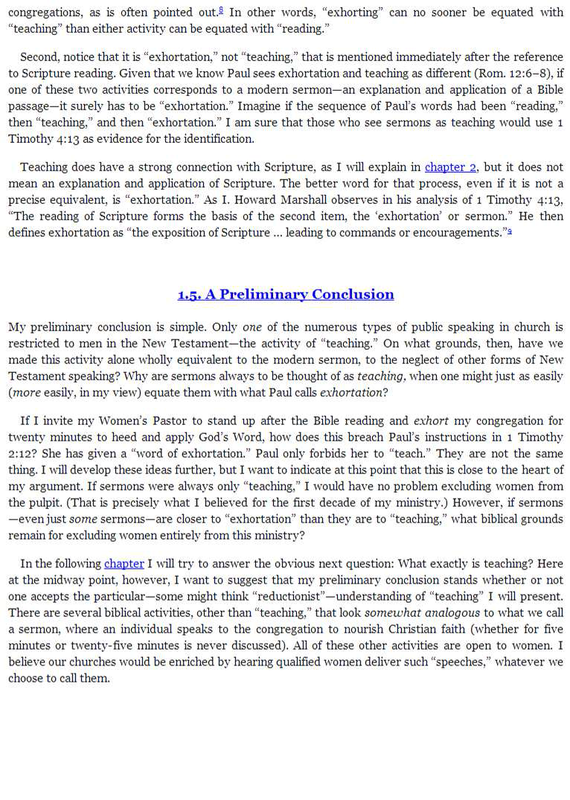 I leave it up to readers to decide whether my argument implies (a) that women can deliver any and every kind of sermon, since ‘teaching’ has no direct equivalent, or (b) that they can deliver only some sermons, since talks in the pulpit lie on a spectrum between ‘exhortation’ and ‘teaching’. I waver between these two responses and tried to indicate this by making ‘b’ the final of the three potential applications of my argument described in the conclusion of the book. Lionel perhaps overlooked this subtlety when he says of me, “He believes there are key differences between men and women in the home and in the church. He is simply arguing that the ministry of the pulpit does not constitute one of these differences.” If this was intended simply to mean that I think women can enter the pulpit, this is right, but if it means I think no difference between men and women will be reflected in the pulpit, this is wrong. I say in the book that the principle of male responsibility for a congregation will find expression in the sermon roster, as it does at St Andrew’s Roseville, where women deliver sermons something like ten Sundays a year. That’s my argument. Where do Lionel and I differ? I will spare readers my collection of quibbles (as I am sure Lionel did in his critique). I want to focus on the heart of the matter. In short, I want to say: Bravo, Lionel. I agree with almost everything you say. It’s just that none of it weakens my case! 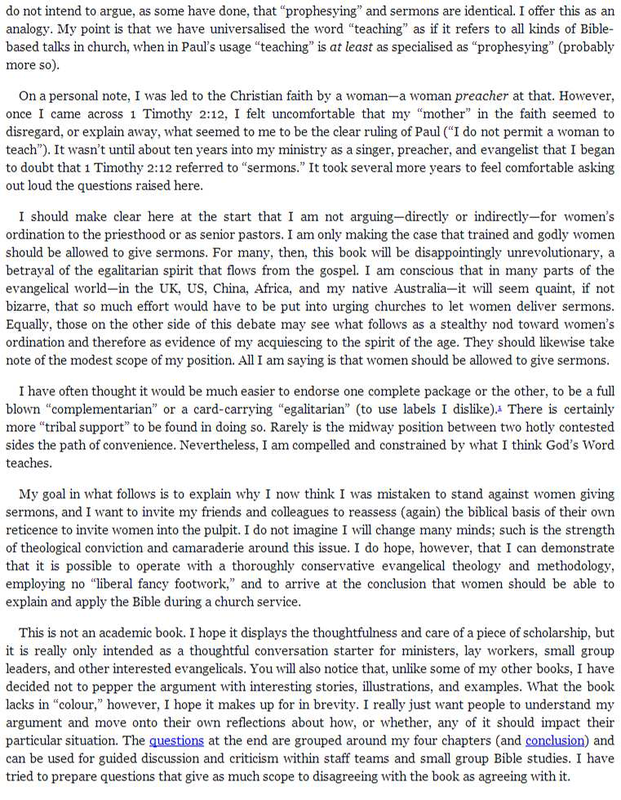 For those who don’t think women should give sermons at all, Lionel has provided a way ‘out’ of my argument. He hasn’t overturned my rationale for inviting women to preach; he has simply helped colleagues who share his view feel better about being unmoved by my argument. That is a success—for both of us. Lionel has held the ground and given further respectability to the general practice of Sydney Anglicans. What he has not done is show why the argument laid out in Hearing Her Voice cannot be right. I now know why the case doesn’t persuade him but not why he thinks it should persuade no one. This is significant. I say in the book that I do not imagine I will quickly change many minds in our circles. I only hope “I can demonstrate that it is possible to operate with a thoroughly conservative evangelical theology and methodology, employing no ‘liberal fancy footwork,’ and to arrive at the conclusion that women should be able to explain and apply the Bible during a church service.” If people in our circles stop repeating things like ‘it is sinful for a women to preach and sinful for a man to let her’, I will be thrilled. I am not on a campaign toward egalitarianism in church ministry—and, as a consequence, I am being hit from the other side by evangelical friends, including my own editor at Zondervan, who see me as a bit of a let down! I just want us all to admit that this issue is not the shibboleth some have made it. I am a Reformed evangelical, Moore College shaped, Bible-expounding, minister, evangelist and public advocate for Christ, and I sincerely believe the Lord is delighted and glorified when I invite trained and godly women to give sermons at St Andrew’s Roseville. The fact that Lionel chose to demonstrate why Dickson is not necessarily right, rather than why he is necessarily wrong, is a notable advance in the conversation. (Though I am sure other more strident critiques will come). There are some things I should concede. Lionel picks me up for frequently contrasting my own strict understanding of ‘teaching’ (in 1 Tim 2:12) with what he calls an “extremely generalised sense”, where ‘to teach’ refers to pretty much any kind of biblical speaking in the front of church. He was kind not to say I ‘caricatured’ the other side. This was a rhetorical mistake on my part, driven by trying to win over those clergy I know in Sydney who won’t even let a woman emcee a church service or introduce a praise song lest she accidentally ‘teach’. That person really exists but I probably should not have tried to draw him into the conversation as much as I did, when there are others like Lionel around, who happily let women do all sorts of speaking in church and wouldn’t think of that as contravening 1 Tim 2:12. That said, Lionel’s definition of teaching is still so broad that I have to say quite firmly that it does not work for Paul, especially for the Pastoral Epistles. When I say ‘does not work’, I do not mean it is not true. I mean it is not precise enough. Precision in this matter is important. My understanding of teaching has been described elsewhere as ‘reductionistic’, a word I propose myself in the book and which some have enthusiastically turned back on me. That’s fine. But one person’s reductionism is another person’s accuracy. Lionel’s definition of ‘teaching’ is “the authoritative transmission of truth from one individual to another.” I like it. I like it a lot. I might borrow it if I ever write a book designed to synthesize the biblical uses of ‘teaching’ into a single definition broad enough not to contradict any particular instance of the word. But that’s the problem: Lionel’s definition of ‘teach’ covers a larger territory of meaning simply because he has gone up the ladder of abstraction. He offers a purely formal, dare I say ‘dictionary’, definition devoid of material substance. Why not go further up the ladder and say to ‘teach’ is to “communicate something.” 1 Tim 2:12 is about communicating something. Sermons involve communicating something. Sermons are therefore teaching. We are talking about Paul and, in particular, we are talking about Paul’s instructions to his colleagues in the Pastoral Epistles. In this context, I could happily borrow Lionel’s definition of teaching so long as we make a modification: ‘teaching’ in the Pastorals is the authoritative transmission of the truth of the apostolic deposit from one individual to another. 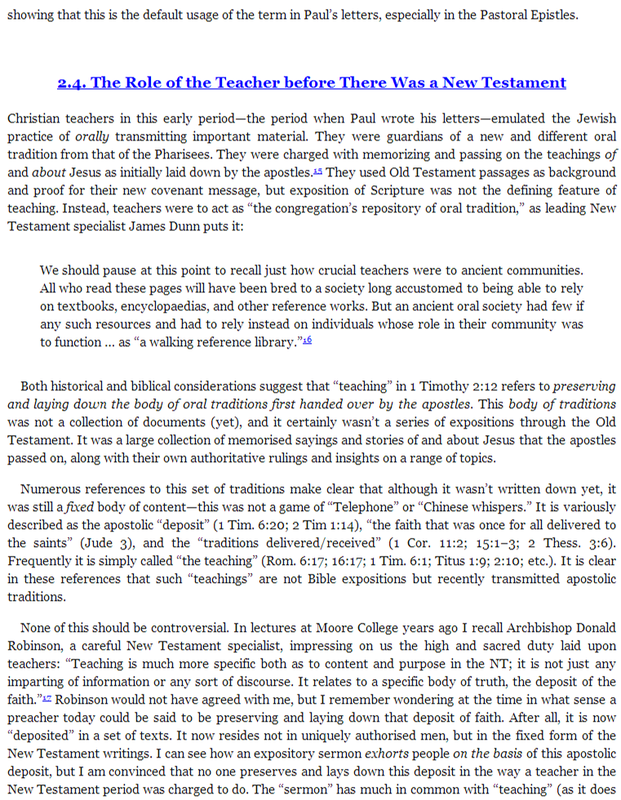 The ‘truth’ Paul consistently has in mind when he uses the word ‘teach’ is the oral traditions of and about Jesus. He does not mean Bible expositions or applications; he is not talking about the authoritative transmission of any truth. He means transferring intact the memorized collection of statements of the apostles (just as the Pharisees, amongst whom Paul was trained, were charged with memorizing and laying down for students the rulings of the rabbis before them). To be clear, I do not claim that this is the only use of ‘teaching’ we find in the Bible or in the New Testament or even in Paul’s letters. I do claim, however, that there are sufficient reasons to think that in the Pastoral Epistles in particular, and in a number of other Pauline epistles more generally, this is what Paul is referring to when he uses the word didaskein. 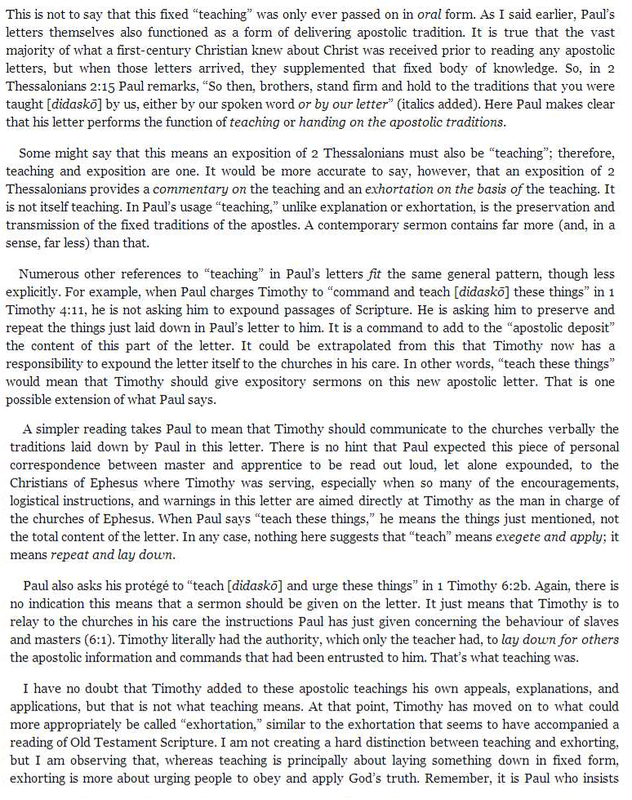 Readers of both our works should observe that Lionel agrees with me that Paul uses ‘teaching’ in precisely this way in some contexts. He cites 2 Tim 2:2, “what you have heard from me in the presence of many witnesses entrust to faithful men who will be able to teach others also.” And he does not dispute any of the other examples discussed in my book (1 Tim 1:10; 6:1; 2 Tim 1:11-14; 2:2; Titus 1:9; 2:10; Rom 6:17; 16:17; Col 2:7; 2 Thess 2:15). I can only assume he accepts that in these passages, too, the truth transmitted via ‘teaching’ is the truth of the apostolic deposit. At one point, Lionel seeks to weaken this observation by saying that when Paul speaks about transmitting ‘oral tradition’ his preferred technical language is ‘deliver/receive’ (e.g., 1 Cor 15:1-3) rather than ‘to teach’. But it is not an ‘either-or’. Both are technical expressions. And on occasion they appear in telling parallel, such as when Paul insists that he came to know the gospel through a direct disclosure from Jesus and not in the normal human way: he insists, “I did not receive it, nor was I taught it” (Gal 1:12). As I repeatedly say in the book, none of what I say about the technical nature of ‘teaching’ terminology is novel or controversial. Pretty much every New Testament specialist notes this usage, especially in the Pastoral Epistles. The difference emerges when I resist expanding the referent for ‘teaching’ to include further elaborations based on the apostolic deposit. I insist that teaching in the technical sense refers to repeating and laying down what the apostles said, not to the many and varied insights and applications which might flow from that body of tradition. My reason for this is simple. I can find excellent evidence that Paul saw ‘teaching’ as transmitting the apostolic deposit, but I cannot find evidence in the Pastorals that he saw it as involving more than that. Let me illustrate this point with a quotation from the great New Testament commentator Doug Moo. 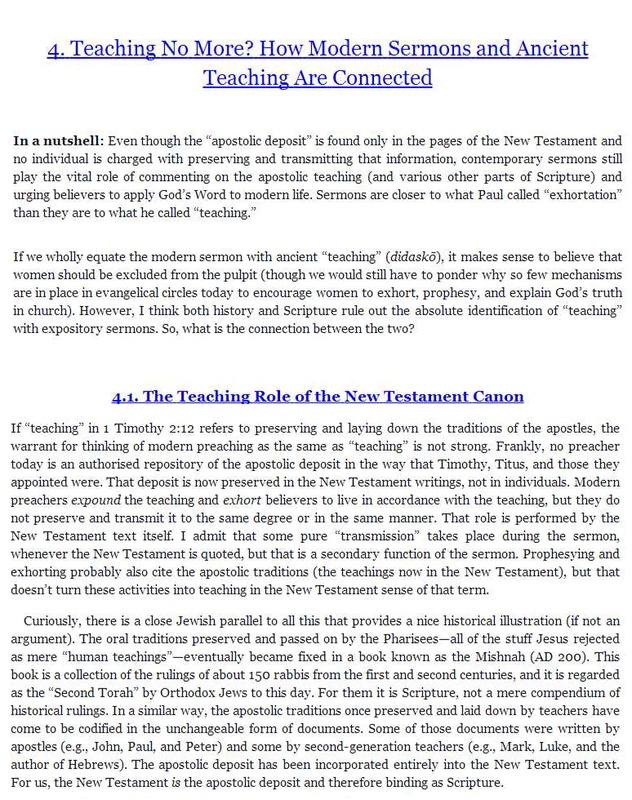 He says that “teaching” refers to “the careful transmission of the (apostolic) tradition concerning Jesus Christ.” That’s right. We’re all on the same page about this. Moo then adds without explanation that it also involves “the authoritative proclamation of God’s will to believers in light of that tradition.” This is where I become ‘reductionistic’. 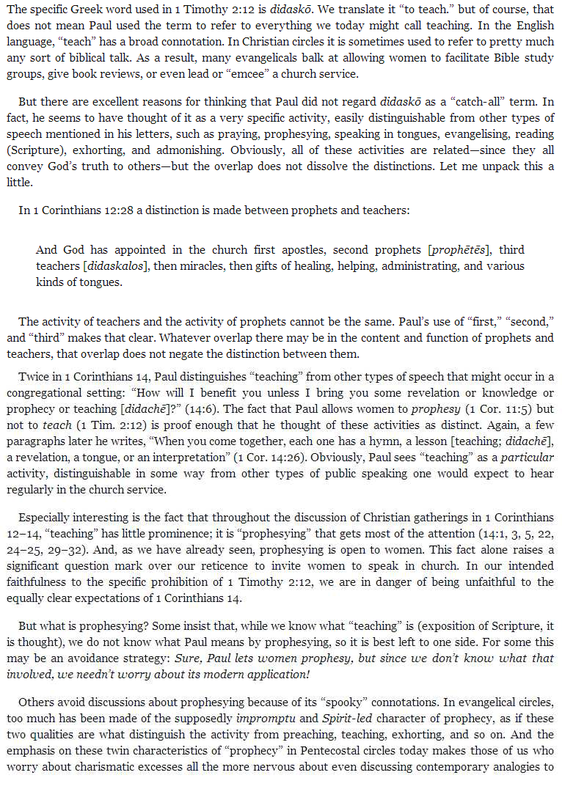 It is easy to confirm the first part of Moo’s definition of teaching in the Pastoral Epistles—that is not in dispute. We cannot demonstrate the second part. Moo provides no passages for us to look at in Paul’s Pastoral Epistles. Nor does Lionel. It only sounds right because that’s basically what we do in our own ‘Bible teaching’. So, I am left with a question: Since we all agree that ‘teaching’ at least includes the careful transmission of the apostolic deposit, and no one can find a passage in the Pastorals where it necessarily means more than that, what reason is there for believing that ‘teaching’ in this context refers to anything other than the authoritative transmission of the truth of the apostolic deposit? In short, Lionel’s description of teaching is broad enough to be true but not specific enough to be accurate in our particular context. A sporting analogy might help. Suppose you met someone unacquainted with Rugby, who knew perfectly well the dictionary definition of the verb to ‘tackle’, to make determined efforts to deal with, but not the specific use of the verb in Rugby. Now imagine you are both at a game and, on seeing a successful Wallabies scrum, your friend declares, “Oh, what excellent tackling!” You would probably want to point out to him that in the context of Rugby the word ‘tackle’ is pretty much only used with a more specific meaning, to stop the forward progress of the ball carrier by seizing them and knocking them to the ground. Your friend’s definition is broad enough to be true but not specific enough to be accurate in that context. That’s how I feel when I read Lionel’s definition of teaching as “the authoritative transmission of truth from one individual to another.” It is true enough not to contradict the evidence but it isn’t precise enough to do justice to the evidence. I am not implying that I am the ‘knower’ (of the Bible or Rugby) and Lionel the neophyte. The point is more basic: Lionel knows as well as I do that the Pastorals clearly use ‘teaching’ in the specific sense of passing on the apostolic deposit and, yet, by contrast, he offers no relevant counter examples to show that ‘teaching’ must be defined more broadly in other places in the Pastorals. Lionel does cite passages such as Deut 4:10-13, Neh 8:8 and Rom 2:20-21, but, as I stress in the book, these are not relevant to Paul’s usage in the context of Christian ministry, let alone the ministry of elders in the Pastorals. Even Rom 2:20-21, though written by Paul, has little to do with what goes on in church, since, as I point out, this passage is a rhetorical mockery of a hypothetical Jewish ‘teacher’ of the Mosaic law to Gentiles. All that it shows is that the Greek verb didaskein can be used broadly to mean “the authoritative transmission of truth from one individual to another” (Lionel’s definition). That is not in dispute, but it is no more helpful for understanding the technical usage in the Pastorals than the broad definition of ‘tackle’ is for understanding its use in Rugby. I need to press this point a little more. 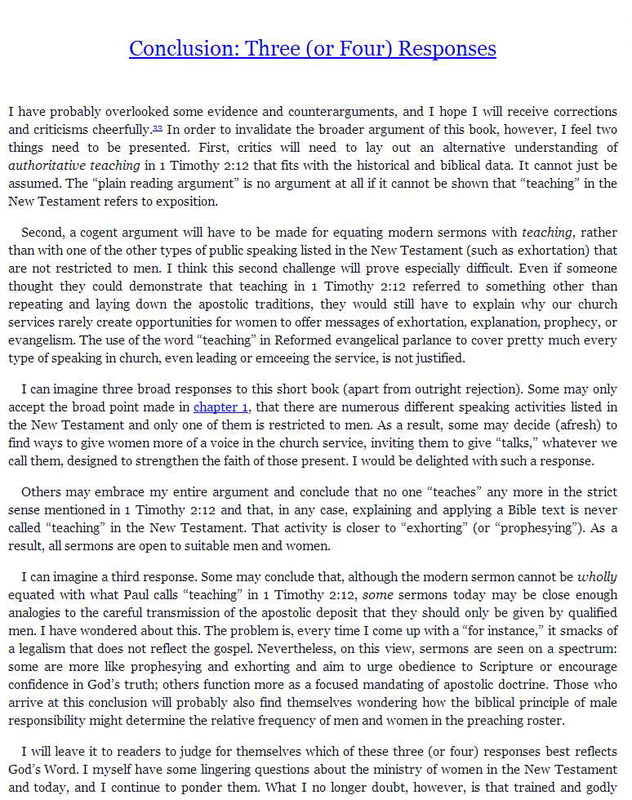 To undermine the case put forward in Hearing Her Voice, someone needs to demonstrate examples of Christian ‘teaching’ in the Pastoral Epistles—and there are many instances of the terminology—that clearly do not refer to the transmitted apostolic deposit (then they need to explain why that usage fits 1 Tim 2:12 better than the usage I am proposing). Without this, Lionel has not weakened my argument. All he has done, as I have said, is provide a possible ‘out’ for those committed to a broad interpretation of the prohibition of 1 Tim 2:12. A large section of Lionel’s critique focused on my deficient theological description of what is going on when we preach God’s word. “I am not satisfied with an understanding of preaching,” he says of my descriptions throughout the book, “which views it simply as ‘commentary plus application’.” By contrast, the description of preaching he offers is majestic and compelling. Lionel shines here, for sure. He made me want to rush out and preach! But, then, I wasn’t trying to write a theology of preaching. What has this got to do with our discussion? Of course my references to “explaining and applying the text of Scripture” were intended only as descriptions of the form of a sermon, not an account of the deep, spiritual things that go on through a sermon. Reading this criticism, I felt like a conductor, to change from a sporting analogy to a musical one, who wrote about certain technical features of good orchestral direction only to be criticized for not offering a proper account of the majesty of the symphony. Lionel beautifully describes sermons as “communicative acts in which a preacher, empowered by the Spirit of God, delivers God’s truth to his hearers in a way which transfixes and transforms their whole heart–mind, will, conscience, affections.” Again, I say: Bravo! I’ll try my best to do all of this next time I step into the pulpit. But I find nothing here that didn’t happen the last time my Women’s Pastor preached at St Andrew’s. That doesn’t transform what she did into ‘teaching’ in the sense intended by Paul in 1 Tim 2:12. I think of such powerful communicative acts as ‘exhorting’ or ‘prophesying’. And why not? Not only have numerous contemporary evangelical scholars before me made the link between sermons and prophesying, it is a perspective with a long pedigree. At one point, Lionel appeals “to the way in which preaching has been understood historically—at least in the Protestant, Reformed, Anglican tradition.” But the history is mixed. William Perkins (1558-1602), an important Anglican leader of the Puritan movement, wrote one of the early texts on giving sermons. The title is ‘The Art of Prophesying’, and it is still in print. When Puritans gathered in Elizabethan England and preached to one another, the conferences were called ‘prophesyings’. Personally, I think ‘exhorting’ is a better biblical word for what we do in sermons, but ‘prophesying’ is pretty good. I am aware that one of the other things Lionel “found most dissatisfying” about my book was my “lack of attention to” what he calls the “relational dynamics” of various types of speech. “As he discussed the various forms of Christian communicative acts in the Bible,” Lionel laments, “he consistently relegated issues of authority in interpersonal relationships to the background.” We all have a view about how we would have written a book if we were the author. My 20 cents worth in response is to point out that ‘authority’ is not a binary thing: ‘teaching’ is ON; ‘exhortation’ and ‘prophesying’ are OFF. Authority lies on a spectrum. With good exegetical ground—and large scholarly company—I read 1 Tim 2:12 as restricting ‘teaching authority’. That is, Paul is not forbidding two things—any ‘teaching’ and any ‘authority’. He is restricting “the authority to teach”. But there are other kinds of authority in church life, which Paul happily grants to women: authority to prophesy in public (1 Cor 11:5), authority to be a deacon (Rom 16:1), authority to be a congregational benefactor (Rom 16:2) and the authority of a co-worker in the gospel (Phil 4:2-3). Paul does not grant women ‘teaching authority’ (or the authority of the elder/overseer) but he does grant a wide range of other types of authority to women. I have heard it argued that because ‘prophesying’ had to be ‘weighed’ (1 Cor 14:29) and could even be ignored (Acts 21:10-14), it had no authority in Paul’s mind (which is why he allowed women to do it). But do we really think the contemporary sermon is exempt from being weighed and, on occasion, ignored? We should just accept that authority lies on a spectrum. Paul was happy for women to exercise ministries at many points along it, just not at every point. We could explore what these various types of authority entail but it wouldn’t change anything. Paul nowhere forbids women to do what we call ‘sermons’. I don’t deny that some sermons may be close analogies to what Paul called ‘teaching’, but other sermons surely are not. They function more as exhortations (empowered by the Spirit of God, etc.) on the basis of the teaching now embedded in Scripture. This does not mean that something less than Pauline ‘teaching’ occurs in our churches today (How could it when that teaching is codified in a book sitting on our laps?). I would argue that something more is happening, since the purpose of ancient teaching—to preserve the apostolic deposit—is wonderfully and immovably realized in the canon of the New Testament. I am perfectly happy to keep calling what we do in the pulpit from week to week ‘teaching’. It is Bible teaching. I do not think we should change our language, let alone the wonderful ordination vows Lionel refers to. There are many biblical words that are employed in English today in ways quite different from their source: ‘church’, ‘fellowship’, ‘religion’, ‘tradition’ and even ‘evangelism’ (I’ve said something about that elsewhere!). Let’s keep the English words and explain the nuances to our people as we go. Teaching, in other words, is a different exercise today from what it was in Paul’s day. I think it is an open question whether in our day Paul would have forbidden a woman to teach from the Bible. It is an open question whether he would have regarded what happened to Eve in the Garden of Eden as sufficient reason for forbidding a woman to teach from the Bible. When you teach from the Bible, in any situation at all, what you are saying to people is, “Look, I am trying to tell you what it says. I speak as to wise men and women. You have your Bibles. You follow along. You judge what I say.” No claim to personal authority with regard to the substance of the message is being made at all. It seems to me that this significant difference between teaching then and teaching now does, in fact, mean that the prohibition on women preaching and teaching need not apply. 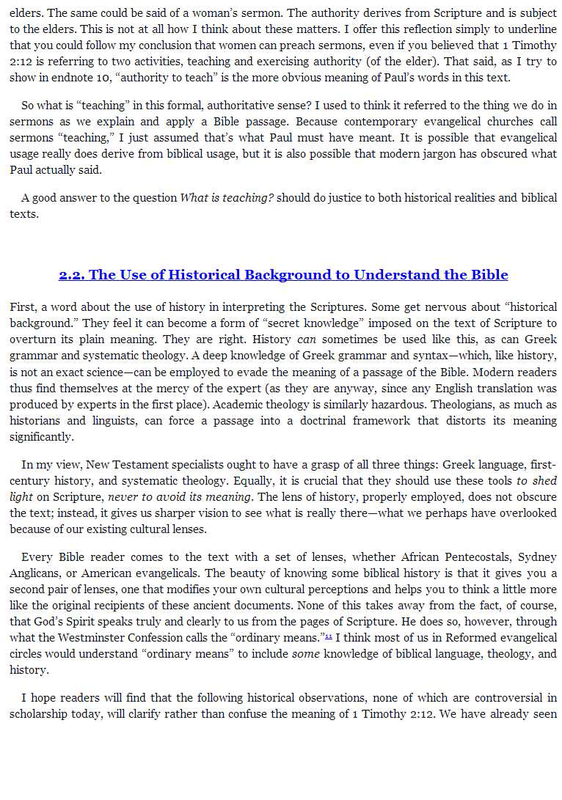 (The Proceedings Of The Conference On Biblical Interpretation [Nashville: Broadmans, 1988], pp.114-115). NB Comments can be found on the original post.